The Center for Advanced Study in the Behavioral Sciences (CASBS), is hosting Symposium titled, “Betrayal and Courage in the Age of #MeToo” on Feb 12th. In this public discussion, psychologist Jennifer Freyd will explore the dire need for institutional courage in the age of #MeToo, and political scientist Vanessa Tyson will delineate the connections between sexual violence and the persistent structural inequality that disproportionately impact women and girls. Throughout the past 18 months, tens of thousands of recollections of sexually violent events have emerged across the United States. In many of these accounts, we also have heard numerous stories of institutional betrayal where college and university administrations, military and church hierarchies, corporate and entertainment industry cultures, and the justice system have failed to support sexual assault survivors, further compounding their trauma. 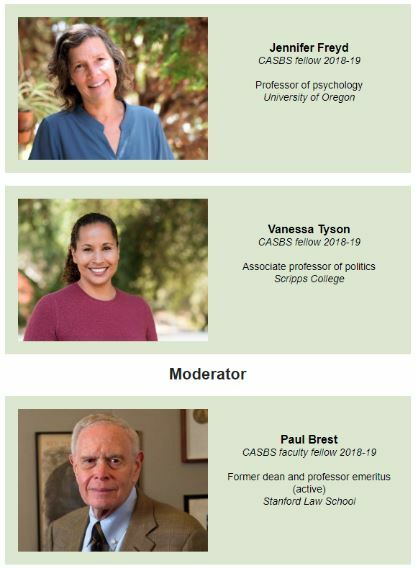 Informed by decades of empirical research and theoretical development, Freyd and Tyson – both 2018-19 CASBS fellows – will bring their cross-disciplinary expertise to bear as they help us understand the underlying dynamics of sexual violence and institutional betrayal, as well as offer essential correctives that can lead us to a more equitable society. The event will take place on February 12 at 5:30pm at Stanford University. Free registration and valet parking are included! RSVP Today HERE. CASBS will also broadcast this event via live web stream. The stream will go live once the talk begins on February 12, 2019 at 5:30pm PST. Please scroll down the CASBS website homepage to view the livestream.